As the sun moved closer to the edge of the world, the sky darkened, lightning played among the clouds and thunder roared. The Mighty Buffalo lifted their heads from grazing and gathered their young about them. The young calves moved even closer to their mothers as thunderbolts filled the sky. The herd milled aimlessly and watched with fear knowing the possibility death was near. First the sound of wind, then a dark shadow crossed over the land. The giant Bird of Thunder swooped down across the edge of the herd and a young calf was lifted into the air. Soon other shadows dropped near the earth and more of the young calves were taken. Lightning streaked across the sky while the voice of thunder spoke with a vengeance. The Mighty Birds that brought the storm disappeared in the distance as Mother Earth opened her arms to receive the rain. The herd returned to their grazing now that the danger was past. 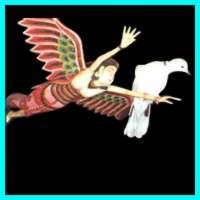 Again the Mighty Thunderbird had stolen from the herd and loosed another storm upon the land. It was as it should be, the herd had grown too large and Mother Earth had needed the rain. As the Giant Birds vanished against the clouds of the distance sky, "She Who Ran Away", a young buffalo mother gave thanks her remaining baby had been spared, as her first calf had been given to the Birds of Thunder. Many of her friends had also lost their offspring to the Storm Bringers and spoke often of the ache the loss had instilled in their hearts. She thought again of the pain she had suffered and gave another silent prayer that this would happen no more. "She Who Ran Away" prayed this prayer with a pure heart and asked only to improve life for the herd and for future generations. Winter passed and lost it's hold on the land. The North Wind grew weaker. The birds of the air had finished their sojourn in the south and would be returning to the land. With their return would come the storms and rain to feed new growths. Every year the Giant Birds returned to the north to build their nests in the high places and bring their young into the world. But now, as the Thunderbirds moved over the plains and looked upon the Earth, they found that the herds of Buffalo that once spaned to the horizon, were not as they once were. 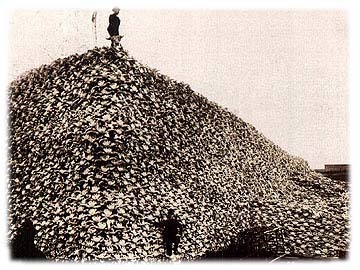 Without the Buffalo there was not enough food for these Mighty Giants and many died on their journey north. So few reached the nesting area that only a few chicks came forth during the hatchling season. The loss of the mighty herds made migration very difficult and many of the young birds died on their way south that fall. Soon they and the buffalo were no more. See Addendum regarding the buffalo below. POWER OF THE SHAMAN: Where Does It Come From, How Does It Work? As mentioned above in the closing sentence of The Legend of the Giant Bird, the loss of the Buffalo would have a devastating effect on the migratory habits of birds of such size. Not everybody makes the connection, but it is pretty simple stuff, without the herds, migration became very difficult and many of the young birds as well as some of the adults died on their way south. We are talking twenty-five foot wingspan Teratorn type birds, animals so huge they couldn't hunt in woodlands or heavy foilage. They needed large open area suchs as the Great Plains or the Argentine Pampas to navigate and hunt. The buffalo is, or was, one of the most important of the Plains animals, and has attracted more attention than any other animal indigenous to the United States. Originally its range was not confined to the Plains, but it was only in the Plains that the animal grew in sufficient numbers to exert any appreciable effect upon man. It is said that the first buffalo seen by a white man was viewed by Cortez and his men in 1521 at Anahuac, where Montezuma maintained a small zoo or menagerie. The nearest place from which this animal could have come was the state of Coahuila, which contains an extension of the Great Plains of the United States south of the Rio Grande. A few years later, probably about 1530, Alvar Nufiez Cabeza de Vaca saw buffalo hides on the edge of the plains in southern Texas. He described these animals and mentioned the fact that the Indians killed them for food. Coronado reached the buffalo country from the other direction in 1542. De Soto's men touched it at one time. None of the other early Spanish explorers saw the buffalo until the beginning of the seventeenth century. The English settlers found buffalo as early as 1612, when Samuel Argoll records seeing the animal, probably near the head of the Potomac River. In 1679 the French missionary Father Hennepin ascended the St. Lawrence and went into the buffalo country bordering the Great Lakes. Colonel William Byrd's party found buffalo in 1729, when surveying the boundary between North Carolina and Virginia. But the important fact is that buffalo were rare in the Eastern woodland area, not numerous enough to exert any influence either on the native races or on the newcomers from Europe. It was not until the settlements approached the prairies, the tall grasslands, which stretched along the margin of the timber line, that the buffalo appear in sufficiently large numbers to make an impression on human life. Herds have been described which were estimated to cover fifty square miles, containing about 500,000 animals. Some herd estimates reached a total 12,000,000 and that they could certainly reach 4,000,000. The estimate total population is considered to have surpassed 60,000,000 animals overall. The important point is that under the natural conditions of the Plains there was a nearly inexhaustible food supply, unrivaled by anything elsewhere known to man. Prior to the coming of man the buffalo had no truly large predators in force such as lions or leopards as say found on the African plains. The Giant Birds were rare and when they did come their hunting was selective and lean, especially when compared to the numbers of buffalo. With no need to develop sophisticated defenses they became an easy victim for the hunter, whether the Native American with bow and arrow or the white man with his long-range buffalo gun. The buffalo was slow of gait, clumsy in movement, and had relatively poor eyesight and little fear of sound. Though it had a fairly keen sense of smell, this sense was useless to it when it was approached from down the wind. Up until the middle of the 17th century, few people dwelt year-round on the open grasslands of the Great Plains. Not only was the tough, thick root masses of the prairie grass impossible to penetrate with digging sticks, but the winter winds, driving snow storms, and often intense summer heat made life extremely difficult for most of the year. Also, until the arrival of the Spanish-introduced horse (in the middle of the 17th century), hunting buffalo anywhere on the Plains, except along its margins, was difficult for people who were on foot and possessed only their dogs to help carry meat, hides, tools, and shelter. Instead, it was the lush river bottoms of the major rivers that crossed the Plains that were occupied and used to forage from to hunt. 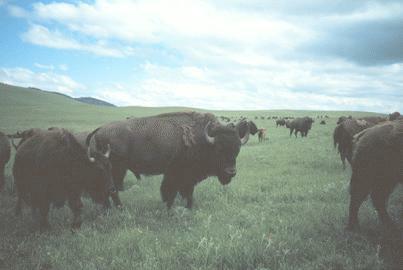 Historically the buffalo had more influence on man than all other Plains animals combined. It was life, food, clothing, and shelter to the Indians. The buffalo and the Plains Indians lived together, and together both passed away. It was only three hundered and fifty-five short years from the time Cortez saw his first buffalo to the year 1876, which marks for the most part, the end of the large herds. After 1876 only one major tribal hunt occured and that was in 1892. The Ojibwe Chief Little Shell bolted North Dakota's Turtle Mountain Reservation with 112 families heading toward the herds in Montana. Little Shell's attempt to fend off starvation and return his tribe to a time before being overcome by a vanishing heritage ended nearly as tragic as those that befell the Giant Birds that once roamed the skys in the the same area with unbridled freedom. Where Is It Now, What Happened To It? by Llewellyn Clark, Peaceseeker All rights reserved.